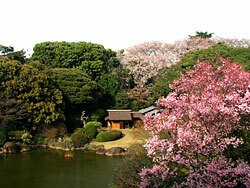 The Museum Garden behind Honkan (main building, Japanese Gallery) will be open to the public during springtime. 10 different species of cherry trees blossom one after another every year. Enjoy strolling among the cherry trees and the five teahouses. The garden entrances are located on either side of the Honkan. (1) Between the Honkan and the Toyokan (closed due to construction), beside the restaurant "Yurinoki". (2) Between the Honkan and the Heiseikan. *Last order 15 minutes before closing. *It will be closed when the garden is closed. Please note that the garden will be closed at times of bad weather. It may also be closed due to conditions caused by the weather. Please check for notices at the main gate.